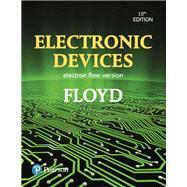 Electronic Devices (Electron Flow Version), 10/e, provides a solid foundation in basic analog electronics and a thorough introduction to analog integrated circuits and programmable devices. The text identifies the circuits and components within a system, helping students see how the circuit relates to the overall system function. Full-color photos and illustrations and easy-to-follow worked examples support the text's strong emphasis on real-world application and troubleshooting. Updated throughout, the Tenth Edition features selected circuits keyed to Multisim V14 and LT Spice files so that students learn how to simulate, analyze, and troubleshoot using the latest circuit simulation software. Additionally, an entirely new Chapter 18, “Communication Devices and Methods,” introduces communication devices and systems.